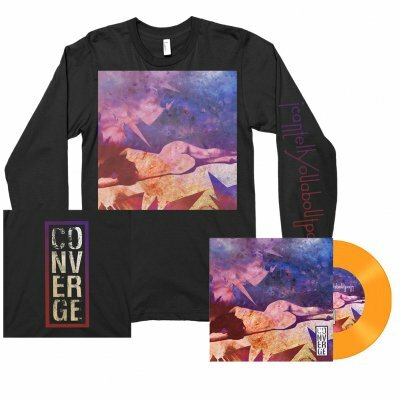 Jake Bannon’s incredible artwork once again graces the cover of Converge’s new release, I can Tell You About Pain 7“, and it’s available now on this long sleeve tee. A standard fitting long sleeve black tee with a double-sided print plus the sleeve print. Epitaph and Deathwish are proud to announce “I Can Tell You About Pain b/w Eve” from aggressive music pioneers, Converge. This two song 7”EP/Digital release is the first new music from the band since their highly regarded 2012 album “All We Love We Leave Behind”. Upon first listen it’s apparent that Converge has evolved exponentially in those years. The raw emotion and anger of “I Can Tell You About Pain” is truly unsettling. While the seven and a half minute epic “Eve” shows the band pushing their melodic leanings to an incredible new level.